Bill Paley’s La Palina brand has been growing. Not only is the line in over 250 shops (as of day one of the show), but the brand’s offerings are also expanding. La Palina debuted two new lines at the show: Maduro, made at Raices Cubanas and featuring a similar blend to the El Diario line but with a Mexican San Andreas wrapper; and La Palina Classic, made at Abe Flores’ factory in the Dominican Republic using a Brazilian Habano wrapper, Ecuadorian binder, and Dominican and Nicaraguan fillers. Particularly intriguing is the new KBII (“Kill Bill II”) a longer (6 x 40) version of the “KB” which is available in boxes of 30 (pictured above). The original “KB” is also now available in boxes of 30, in addition to the four-pack that it originally came in. Paley tells me his next cigar, which he’s already working on, will be his first made in Nicaragua. Nat Sherman is a classic name in the tobacco industry that sometimes gets overlooked when it comes to premium cigars. Mike Herklots, formerly of Davidoff NYC, is aiming to change that with the Timeless Series. The original Timeless is made at the MATASA factory in the Dominican, and two new sizes debuted at the Trade Show (a petit lancero with a pigtail cap, and a short perfecto) which brings the line up to six sizes. A new Nicaraguan Timeless debuted at the show. It is made at Nestor Plasencia’s factory and will come in three sizes to start. I smoked one on the floor, and found a heavy, earthy cigar with plenty of spice that should be a hit with Nicaraguan cigar fans. Herklots also emphasized that their core lines are all price-protected now (limiting the amount that they can be discounted), an effort to make the cigars more friendly to brick and mortar retailers who might be reluctant to carry a cigar that can be heavily discounted online. 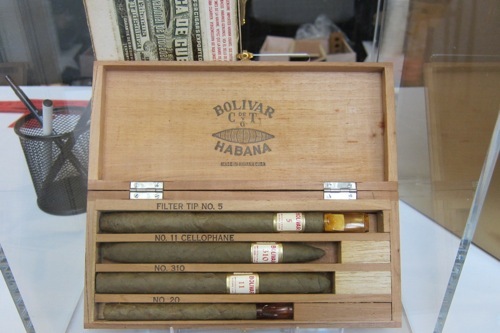 Also of note, Nat Sherman was raffling off a box of four pre-embargo Bolivar cigars (pictured above) with the proceeds going towards the IPCPR’s legislative efforts. 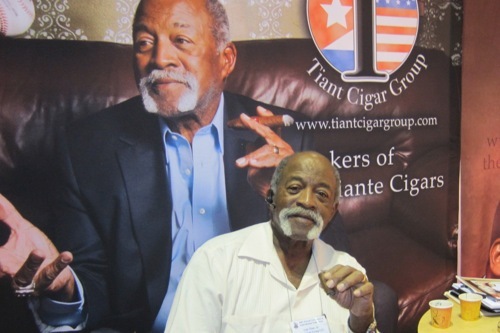 Legendary Cuban Red Sox pitcher Luis Tiant didn’t have any new cigars to debut at this year’s show. The brand is now up to 150 shops nationwide, and while New England is still the highest concentration, they tell me they are seeing growth in Florida and elsewhere. Originally, they planned on introducing two new cigars at the show, but I’m told they were still being finalized and they are now shooting for a September or October release. 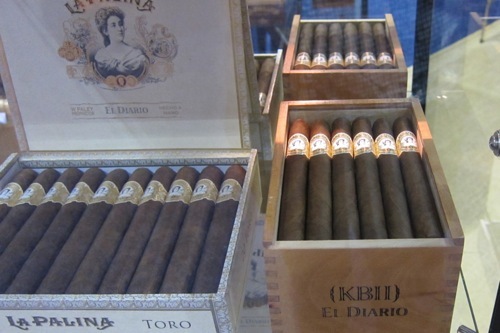 The new blends, like the originals, will be made at Don Pepin Garcia’s My Father Cigars factory. They will expand the company portfolio with one being the strongest cigar yet and the other being milder than either of the two original lines. 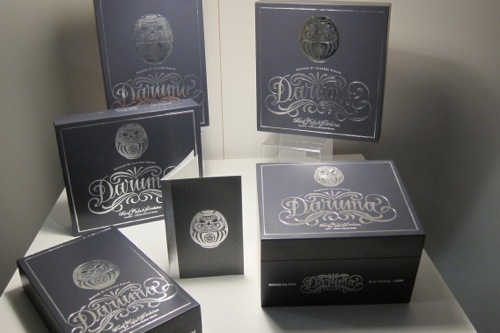 As I mentioned in my preview of the new cigars I had tried before the show even opened, Room 101 is about to start shipping Daruma. Not too much to add to my previous report on the cigar (which features an Ecuadorian Habano wrapper, Brazilian binder, and Dominican and Honduran filler) except that Room 101 head honcho Matt Booth was raving about the Lancero size (7 x 38), his favorite of the line. Check back in the next few days for more information from the show. In the meantime, let us know what you think of these new releases. This is great. I enjoy reading about the makers and blenders of great smokes. My life is nothing but me talking cigars and my friends and family want me to nice off. Keep doing the stories and I will keep reading. Cool pick of El Tiante. Is he a pretty nice guy in person? I would hope so. Awesome baseball career, and I like his smokes too, so I'd like to think he's a good guy. Though I only got to speak to him briefly, shake his hand and thank him for so much pleasure watching him when he was playing, Luis immediately came across as a warm, genuine man, the kind of person you'd like to spend time with. If you get the chance to meet him, don't miss it. He was recently on a local radio program, and came across as extraordinary nice, and personable. I've heard nothing but good things about him. I remember visiting Fenway a few years ago when the Mets were playing the Red Sox, and he was standing in the sandwich cart he owns making sandwiches.